With the demand for affordable housing units on the rise, developers maximized available floor space at condominium developments to the smallest possible liveable space. 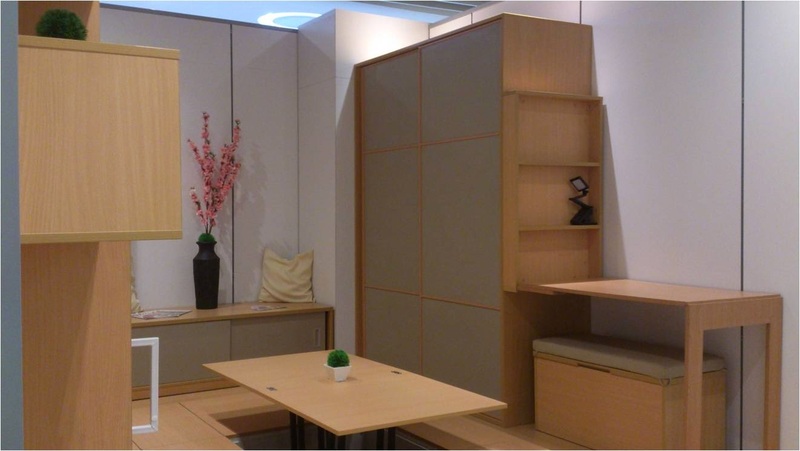 It isn’t uncommon for some units to be as small as 18-square meters, making it a cramped one for a starting couple. 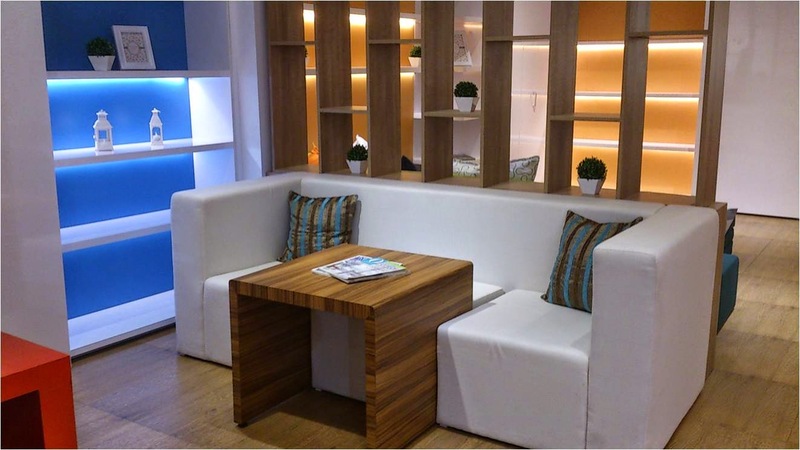 ErgoHome has come up with original lifestyle solutions to customize any space according to your needs with this in mind. Ng says it is a fact that many condo units have small spaces that make it difficult for homeowners to fit furniture in the different parts of a house. “When you have a small space, storage is a problem, and movement is a problem,” Ng added. This is the motivation behind ErgoHome’s desire to create customized furniture to address the needs of small condo unit owners. It took ErgoHome three years to perfect the design for its multi-function furniture. Ng says it took them some time to find a mechanism that is safe and easy to operate that will realize their vision. It was not until they found a supplier for sturdy mechanism that they were able to come up with the functional pieces of ErgoHome. 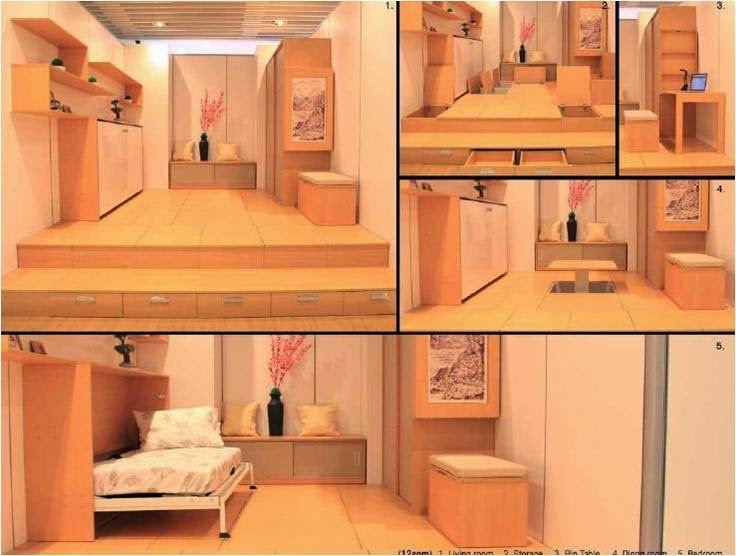 “We were finally able to develop a bed that can be hidden in a cabinet. We put our thoughts into a drawing, and from there we were able to make it into furniture,” he adds. 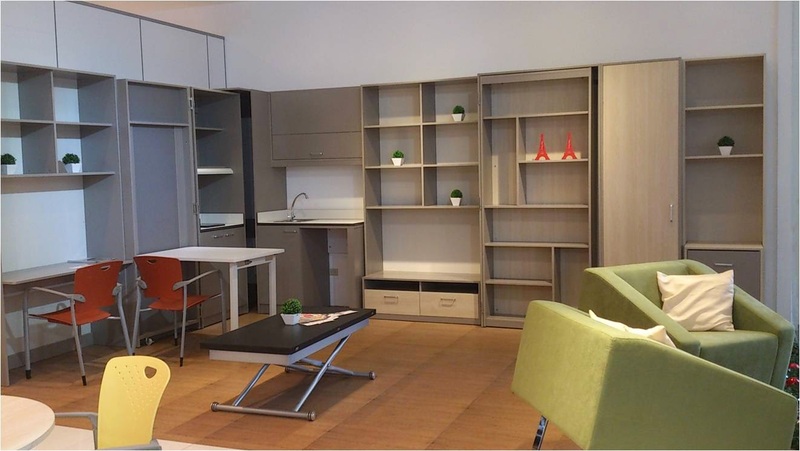 From beds in cabinets, ErgoHome also has collapsible workstations that are attached to shelving units, an entire kitchen work area and cupboard hidden inside a cabinet, and even a dining table that materializes magically from the floor. “We can expand your space to three times as much easily with just the right furniture,” he declares. Most of the furniture we have developed has multiple uses. You can use the furniture when you need it, and when you don’t need it, you can make the furniture disappear,” he explains. To provide added value to clients, ErgoHome offers free professional consultation and 3D model design, to enable you to customize and visualize your space into your dream unit before it is actually made. Free delivery and installation of your furnishings are included to take away the stress of having to assemble and fit everything by yourself. 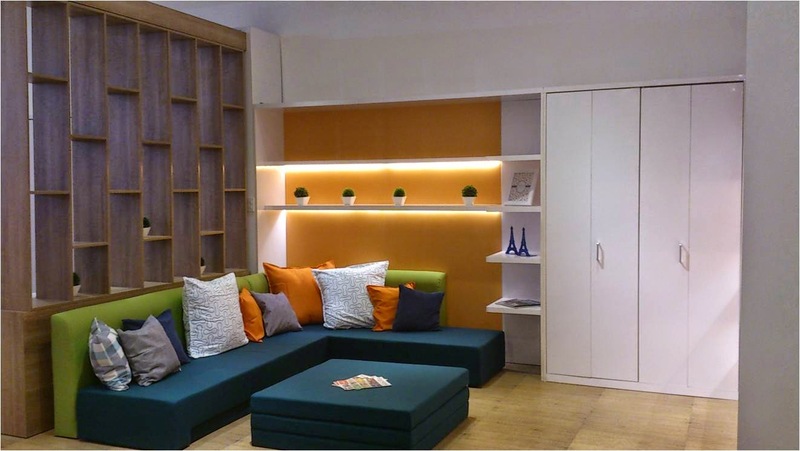 To see how ErgoHome can magically transform your condo units into a spacious haven, visit its showrooms at SM Mall of Asia (+632)831-4110, SM Megamall, Cebu and Davao and soon, SM Aura. Transform a lounge into a workspace and bedroom with just a few adjustments. 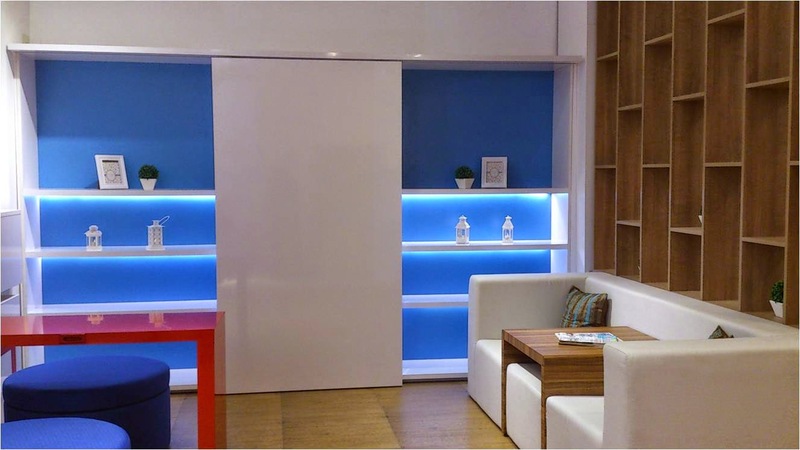 A storage unit at the side has recessed panels that can be pulled out to reveal workstations. With a handful of ottomans, which can be opened for additional storage, children can easily work and play in this room. On the other hand, the sofa on the other side of the room has a built-in coffee table that can be pulled out to entertain guests. The extra space in the sofa can either seat an extra guest or can be used as a bigger coach or bed. The shelving unit can be used for a flatscreen TV or as shelving for books and knick-knacks. Meanwhile, the sliding panel can hide an extra bed should it be needed. Transform a living room into a spare bedroom with the use of a couple of functional furnishings. A sofa of durable stacking foam can be transformed into a casual sleeping space by just rearranging the foam stacks. It raises the idea of lounging around in one’s living room to a different level. On the other hand, the shelving unit at the back hides a single bed. By sliding a wooden panel, a recessed section holding the folding bed is exposed. With just a pull on the handle, the bed is set up in instant. 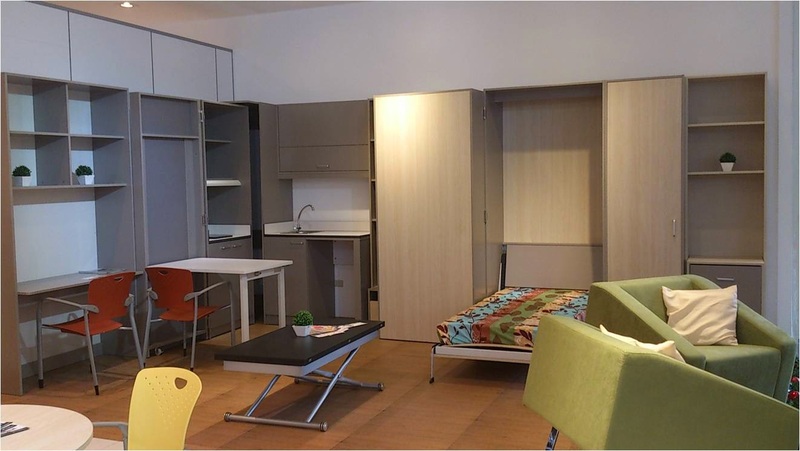 A 14-square meter condominium unit can easily be transformed into a variety of living spaces with just a couple of handy furnishing units. To provide needed storage space in this unit, the floor is raised by about a feet from the floor. The steps leading into room hide drawers where things can be headed. More space is available under the floorboards. A vacuum pull is used to open the wooden panel to expose additional storage. The shelving unit on the side of the room hides a folding bed. To reveal the bed, you just need to push a button, and the bed panel slowly goes down. In case of a brownout, you can easily disconnect the motor from a side of the shelving unit to be able to manually pull down the bed. Come dinnertime, a push of the button raises a panel from the floor to reveal a Japanese-style dining area. After a meal, you can easily hide the table with the push of a button. Hidden from sight, the table becomes part of the living room area. The shelving unit at the end of the room serves as a window seat. It can also be constructed in such a way to hide a flatscreen LED TV that can be revealed or hidden with a push of the button. The cabinet at the side of the room has a pull down panel that serves as a workspace. A chest at the side serves as a seat. 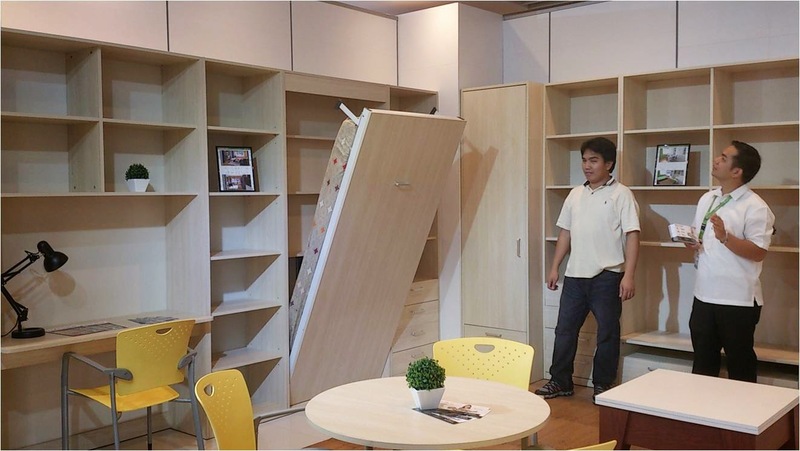 This dorm unit has ample of shelves where students can pile their books and equipment. A workspace is built into the shelf, while drawers at the end can be used to keep clothes. A panel at the end of the shelves can be pulled down to reveal a single bed. Behind the bed is an additional shelf space to house private keepsakes or precious items. 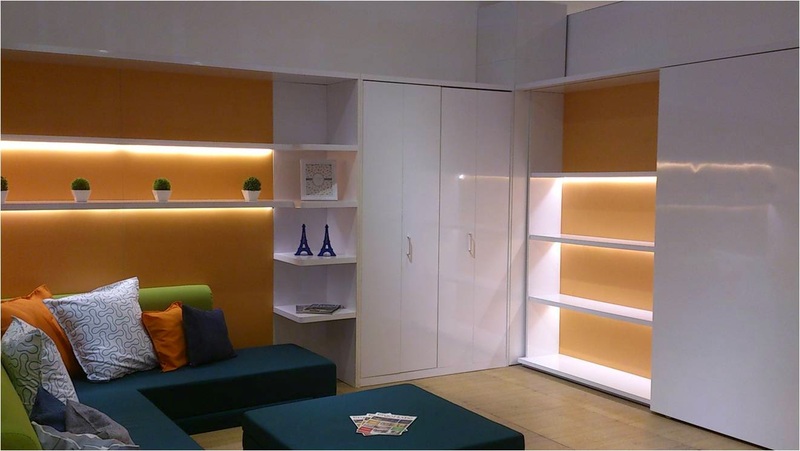 If the room is to be used by two students, another similar shelving unit will provide needed workspace and bed in similar fashion. 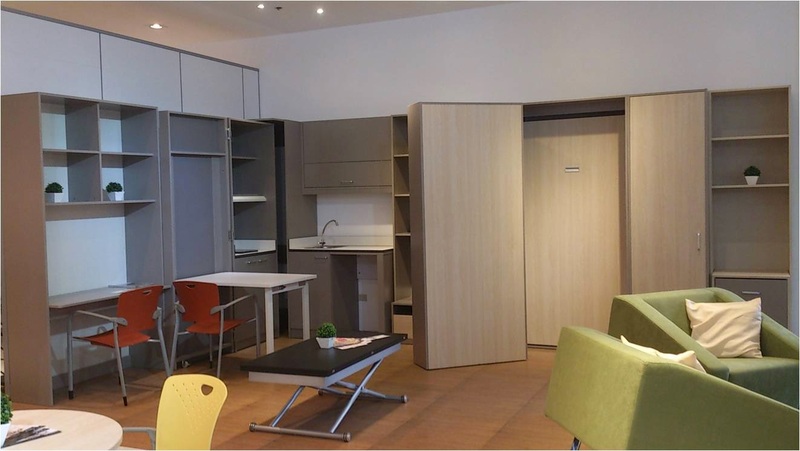 Condominium unit uses a number of storage solutions to maximize its 18-square meter space. Built in to a shelving unit at a side of the room is a workspace. 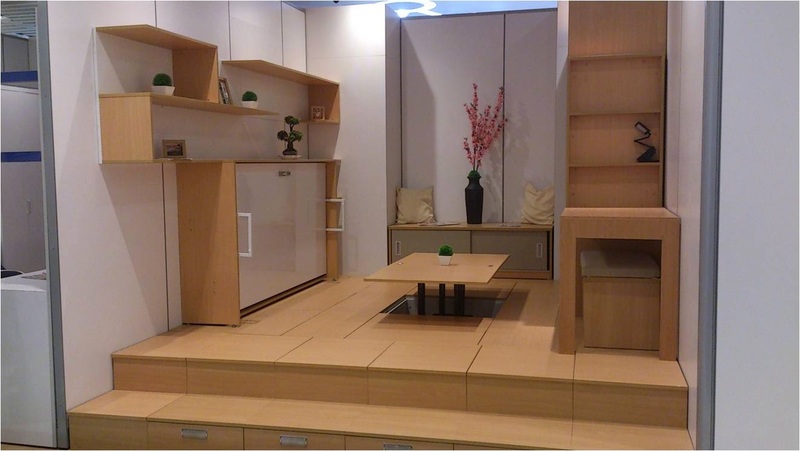 On the other hand, a kitchen counter and cupboard is hidden inside a cabinet that can be tucked away at a corner space. The refrigerator and sink is incorporated into another shelving space, while the bed is hidden behind a wooden. 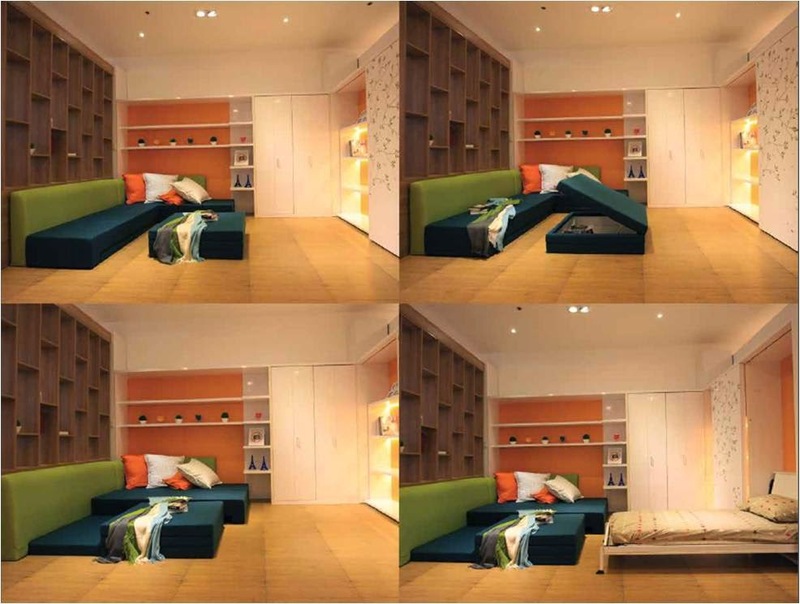 If an extra bed is needed, a sofa bed can be used. The center table has adjustable legs that can be raised to transform it into a dining table.